Published by the University of California, Los Angeles, Association of Graduate Dance Ethnologists. Chapters included such subjects as Dance, Rites and ceremonies, and Rites and ceremonies. It is produced semi-annually. De Alaiza, C.H.. "The Basque jautzi dance today." In The Journal of the Association of Graduate Dance Ethnologists, 1:29-34 (Spring 1977). Los Angeles. Zazpi Jausiak. 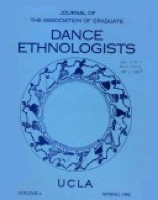 The Journal of the Association of Graduate Dance Ethnologists. Los Angeles. Vol. 1 (Spr. 1977), p.12-7. "The newest changes in Rom dance: Serbia and Macedonia." Dunin, Elsie Ivancich.